Hello, hello! This is Kol Yisreal (The Voice of Isreal Radio) giving you some latest news. 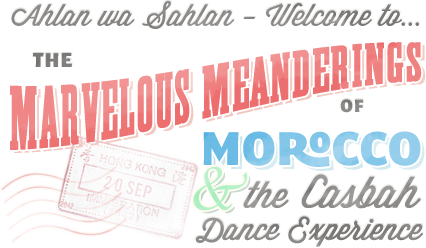 Within the framework of the Israel Festival held during May and June of 1990, we were privileged to host for the first time ever the many wonderful dance artists who convened for the First Annual Oriental Dance Congress in Jerusalem. These were the magic names that we Arabesque readers have been seeing in print for some time — here they were in the flesh and blood, and they were fabulous! Oriental dance has made a triumphant but belated entry into our culture, and from having been previously despised as low class entertainment, it has risen enough in public regard to be taken seriously, to be taught widely and to be enjoyed by nearly everyone. Dancers trained in America have brought the dance back to Isreal, and a new wave of self confidence among our own Oriental communities (Moroccans, Yemenites, Iraquis, and Kurds) has also contributed to this happening. For three days, close to 100 eager participants came from all over the country to learn and to attend the evening performances. Girls and women of all ages were garbed in an array of the most diverse outfits, from body stockings to glamorous show attire. Even a Finnish contingent arrived (the very idea of an Israeli Oriental Dance Congress came from the Finnish dancer Irene Jelin.) Classes and lectures took place during the day at various locations, and on the last day we were in a studio in the most beautiful location in the world. It was situated opposite the Old City of Jerusalem, with the Tower of David rising majestically before us across the valley. Evening performances were held at the Khan, a theater in an ancient restored caravanserai. The moderator and translator of the congress was Dr Rachel Milstein, dancer and lecturer on Islamic art at the Hebrew University. 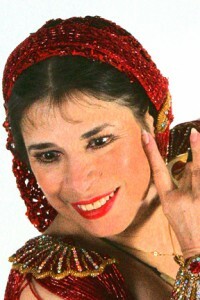 Tel Aviv’s Sahar (Debby Goldman) represented the local talent and also taught and performed. As we progressed through the three days, it became evident that oriental dance, not being codified — up to now — like European Ballet and classical Indian dance, is actually very difficult to teach. The plurality of approaches brought a great diversity in styles, with each dancer teaching according to her own concepts. Teaching one to extend a leg is rather easy in comparison with teaching the intricate minimovements of pelvis and hips which often elude analysis and description. 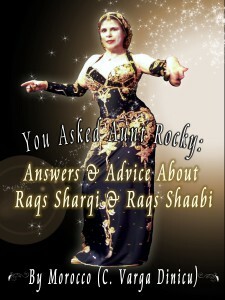 We were fortunate to have had on stage as well as in class some of the best exponents of the Oriental dance styles. One morning, Sara Levi, founder and director of the Inbal Dance Theatre, arrived and introduced to the pupils the indigenous Yemenite movements. She brought with her Ilana Cohen, lead dancer of the company. Ilana impressed everyone with her deeply felt portrait of a Bedouin woman. Later the class learned how to knead dough to make pita (Arab) bread dance-wise! Here was Wendy Buonaventura from England; dancer, researcher and author, petite and willowy. She seemed to rise up out of the ground, swaying hypnotically, so very serpent-like. Serena Wilson, superb in her body vibrations, also brought the Oriental dance a different direction. In one of her theatre solos, she honoured her great teacher Ruth St Denis. 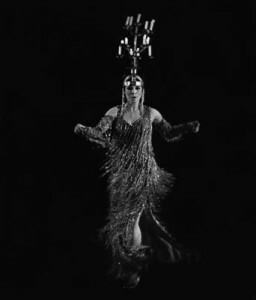 In a second dance entitled The Kooch, Serena was a marionette; as the carnival music faded, the tones of her finger cymbals brought her to life. Morocco (Carolina Varga Dinicu) burst upon us like a Mother Goddess, her energy and body pulsations radiating joy and excitement. Morocco also proved an excellent teacher. Quite fascinating was her North African dance the Guedra, a ritual in which the performer, through hand movements and subtle body pulsations enters a trance-like state. Morocco was assisted by her male protege, Tarik abd el Malik, of Jamaican origin, who did well with a traditional display of balance while negotiating a trayful of lighted candles on his head. Can trance be taught? Dietlinda Karkutli of Germany tried her best to put her class into trance. Heads were rotating, arms were flailing, shouts went up. It was supposed to produce the zar, a ritual dance of exorcism. Well, the evil spirits must have fled, because a good time was had by all! Israeli radio and television took positive note of this unusual event. All who attended were immensely enriched by the experience and highly stimulated. We sincerely hope that another Oriental Dance Congress will soon take place in Israel and establish a new tradition in this ancient land.